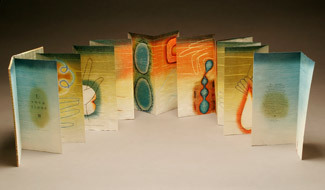 Poem, pochoir, handmade paper, and ten-panel hardcover accordion binding by Jean Buescher Bartlett. 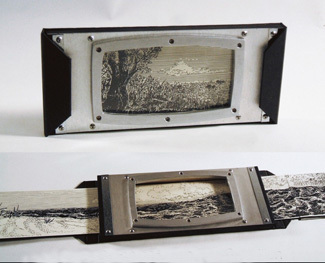 Cyanotype sun prints by Tom Finke. Printed from handset Perpetua type on Lana Laid paper in three colors. Be the first to review “Jean Buescher Bartlett – What’s Out There” Click here to cancel reply.